Lamp base turned 14". Post of walnut laminated with maple accents. Maple burl feature ring in post. 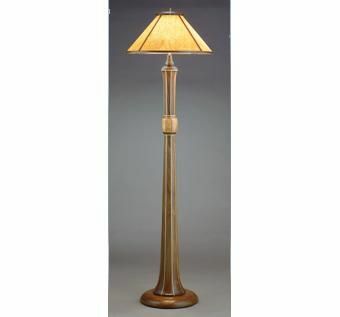 Overall height of lamp is approximately 72". Brass fittings with 3 clustered pull chain brass sockets holding 100w equivalent CFL bulbs. Shade of laminated walnut with freehand turnings and maple inserts. Four translucent panels of birds eye maple veneer stabilized with fiberglass cloth and epoxy resin. 21" x 11" to top of cap. 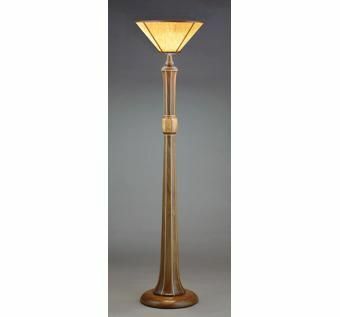 This lamp is also available as a torchiere, with a 17" shade inverted. Mica panels in the shade are also available. Retail Price: $1580 as shown with translucent wood shade. $1490 with optional mica shade. Shipping costs extra. 6% sales tax applicable for Mass residents. The final product is very beautiful but the delays were a little bit much. But if time is of no concern then the final result is worth the wait. Thanks.